For home-based indoor gardens and vegetable farms, improving harvests start with selecting the right type of grow light. On the market today, there are several LED models to choose from, including full spectrum LED grow lamps. These robust lighting systems are designed to mimic natural sunlight by providing a range of light bands during illumination. 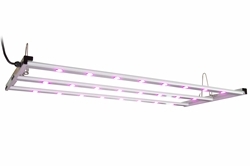 Learn more about this type of LED grow light below. What is a Full Spectrum LED Grow Light? A full spectrum LED grow light is an energy-efficient LED lamp that offers a balanced range of red, blue and green light. The balanced nature of the light beams can be used to supplement natural sunlight in indoor greenhouses or growing rooms. This practice is common in locations that experience long periods of seasonal darkness throughout the year. Full spectrum LED grow lamps are capable of streamlining crop operations by simplifying the spectral requirements of plants. Instead of investing in both high-spectrum and low-spectrum units, a full-spectrum LED light could be utilized instead. Although full-spectrum lighting is also available in fluorescent bulbs, LEDs perform better from a long-term perspective. The solid-state lamps also cater to tight spaces and installations, allowing individuals to configure growing setups with optimized illumination. Is Full Spectrum LED Light Right for Me? The answer to this question depends on the type of plants in the garden and the goals of the grower. If the overall goal is to extend the general growing season, full spectrum LED lights are suitable because the systems provide natural sunlight conditions. In some cases, LED grow lights that emit specific light bands are preferred. For example, if growers intend to boost the flowering responses of their plants, a lamp that offers (warm) red-spectrum light would be more effective. Moreover, (cool) blue spectrum is applicable to increasing vegetative aspects of plant growth.